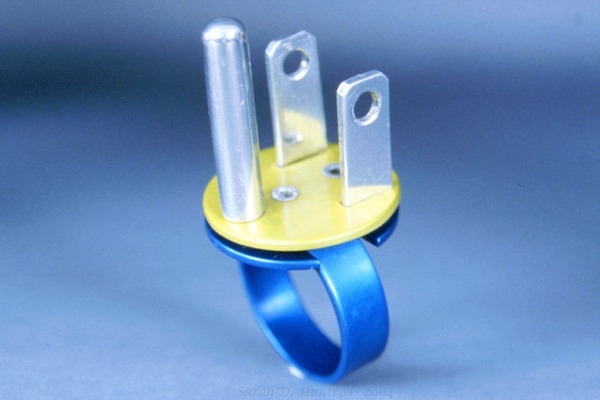 The Captain Electric Supercharger Ring in anodized aluminum, by Sarah Huntrods 2001. Yes, it actually fits in an electrical socket (don’t try it at home). I’ve been a writer all my life, but avoided my calling until 2010, when a combination of migraines and the wrong prescription drugs jolted my reality so hard I had to write out the demons or die. I completed my first novel in 2011 and have since stuffed it away until I’m ready to rewrite it from scratch. I started my second novel this year. At the turn of the century, I majored in jewellery and metalsmithing at ACAD. From there, I moved onto comic illustration, anatomical illustration, and graphic design. I also mod Morrowind, and have been interviewed for Bethesda’s Blog. I’m currently retooling my portfolio to include graphic design – specifically book covers – while I write the occasional short story and wrestle my longer work into submission.